To get things started we have created a 10 week training plan which is printed below with training due to begin on Monday 8th April. This will give you time to dust off the cobwebs and get a few light runs in before the serious business begins. Each week we will review progress and let you know how our race preparation is evolving as unforeseen circumstances can arise and plans may need adjusting accordingly. This is true for every runner at some stage of their training. In last weeks article we published a 10 week training plan. This is available on the press area of the www.halfonthehead.com website. The types of training varies from day to day as we find that this prevents boredom and makes training more interesting and less tedious. The most important session each week is your long run. 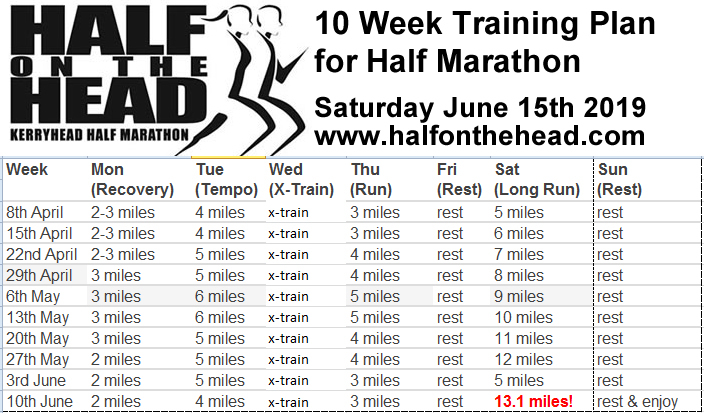 The distance will increase each week and is designed to get you ready for the half marathon on 15th June. Ideally, you should do your long runs on the same day and at the same time as the race is due to begin as this will give you the best preparation for race day. Active Recovery: This is an important part of training and should take place a day or two after your long run. It can consist of anything from a brisk walk to a light run or a few miles on a bike. Working at a lower intensity, as opposed to doing absolutely nothing, will help increase recovery by increasing blood flow to your muscles and tissues. Giving your circulation a little boost helps get nutrients (like amino acids and oxygen) to your muscles so they can repair themselves and also helps flush out lactic acid build up which can contribute to muscle damage and fatigue. Tempo Runs: The benefit of incorporating tempo runs into your training is well documented. Regular runs will allow you to increase your lactate threshold and improve your metabolic fitness allowing you to run farther and faster. Tempo runs should be at about 85%-90% of maximum or about 30second per miles slower than your 5k race pace. Cross Training (x-train): We take regular classes in Banna Beach Leisure Centre and enjoy the social aspect of group exercise. Circuits, spinning, weights, swimming or similar will provide a break from running as well as delivering a good cardio, core and strengthening workout. Rest Days: These are extremely important and are often ignored. We often feel great and ready for another run but taking a break can help prevent injury. Rest days allow your body to recover and to mend tissue damage thus making you stronger for your next run. Our Progress: Training is set to begin next Monday so this week we did a couple of light runs to dust off the cobwebs and prepare ourselves mentally for the challenge ahead. Signing up for an event is a great source of motivation and following a structured training plan will help you achieve your goals. Signing up for a race really focuses the mind and helps to get you motivated to train as you want to perform to your best on race day. We are delighted that our training has finally started for this year’s Half on the Head. Last week we did a couple of cross training sessions as sniffles and head colds have limited our outdoor running to a fairly easy 5k. As this is cold and flu season here is some general advice on running with a cold. Once it stays above the chest then light training is ok. You may find that breathing may be more difficult and you should wrap up well and ensure that you shower and change directly after your run to avoid getting cold. Next Saturday our long run is a 5 miler (8km) and while this might seem short to many runners it is really important to build up your distance gradually. Last year we went from having only run a 5k in training to competing in a 10-mile race and we both suffered injuries due to lack of training. It doesn’t have to be complicated but the following tips should help you progress more easily. Slow your pace: Long runs are about putting miles in the legs, not about speed. 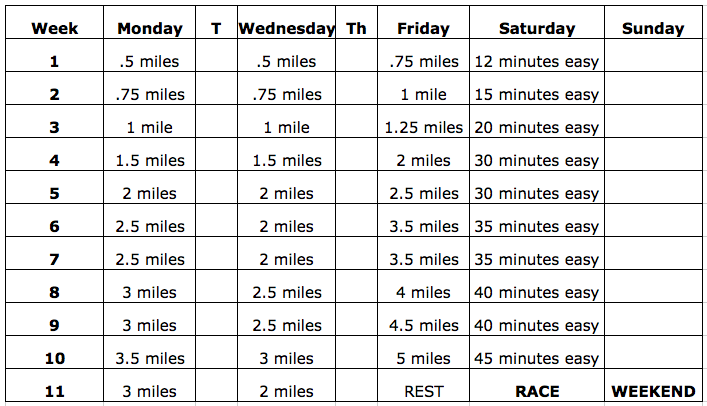 Increase the distance gradually: Try and plan a route that will add roughly a mile a week. Your body needs to acclimatise slowly and your muscles to adapt to these new distances. Be aware that the extra mile will often be the toughest as this will be the first occasion your muscles have experienced this new longer distance and running time. Break it up: Mentally break your run into manageable segments. For example, 6 miles can be thought of as two 5k runs, this distance will be familiar to you at this stage and breaking down a run in your mind in this way can provide focus and a psychological boost. Fill the tank: Make sure you are fuelled up properly and leave a gap of a least an hour between a run and a main meal. Take on enough water before, during and after your run. Plan a looped route to allow you pass your water supply regularly, or consider leaving water along the way. Monday consisted of a 5k run to get some miles in the legs. On Tuesday we did a tempo run and a spin class on Wednesday will fulfil our cross training needs this week.